Since I can write so diligently for a $5 sponsored post, there's no reason why I don't write the same thing for Advertlets who offer RM20 for this post. 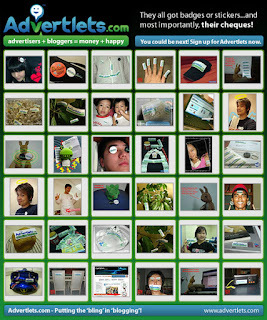 You can see the bloggers in the picture above showing off their Advertlets stickers, badges and cheques! They did write the same post s and got rewarded for their efforts. Cashing out from Advertlets? I'm not making much yet but if I do, I'll probably buy myself a new mouse pad for my blogging task instead of using the touch pad. Well, join me and write this post in your blog too.